Spanish rabbi; born in 1235 at Barcelona; died in 1310. 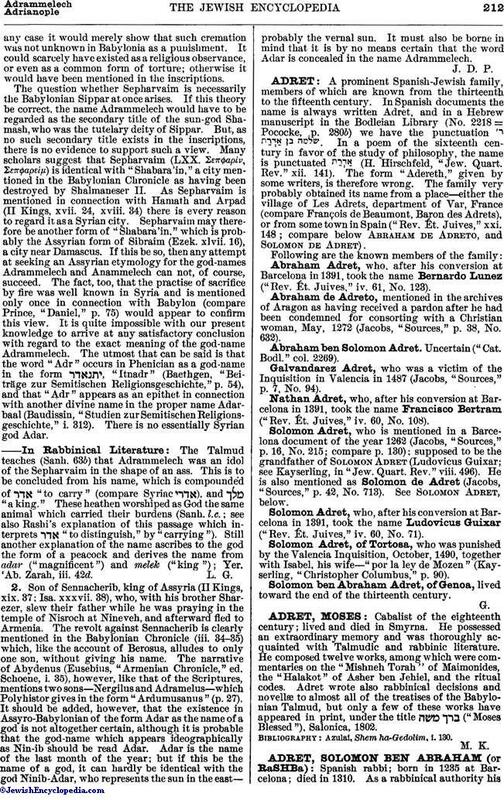 As a rabbinical authority hisfame was such that he was designated as El Rab d'España ("The Rabbi of Spain"). A manuscript purporting to be a certificate of indebtedness, dated 1262, in favor of a certain Solomon Adret, Jew of Barcelona, and a passport for the same Adret, dated 1269, are still extant (Jacobs, "Sources," pp. 16, 43, No. 130). Moses ben Naḥman (Naḥmanides) and Jonah of Gerona were his teachers. He was a master in the study of the Talmud, and was not opposed to the Cabala. Adret was very active as a rabbi and as an author. 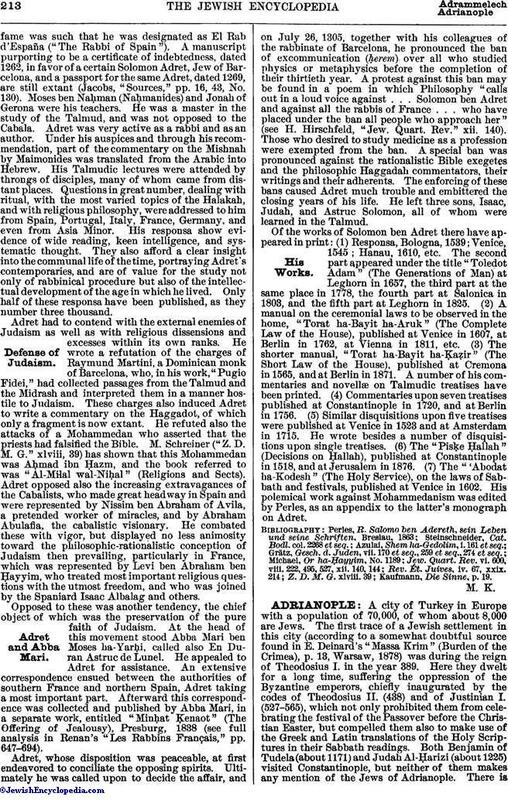 Under his auspices and through his recommendation, part of the commentary on the Mishnah by Maimonides was translated from the Arabic into Hebrew. His Talmudic lectures were attended by throngs of disciples, many of whom came from distant places. Questions in great number, dealing with ritual, with the most varied topics of the Halakah, and with religious philosophy, were addressed to him from Spain, Portugal, Italy, France, Germany, and even from Asia Minor. His responsa show evidence of wide reading, keen intelligence, and systematic thought. They also afford a clear insight into the communal life of the time, portraying Adret's contemporaries, and are of value for the study not only of rabbinical procedure but also of the intellectual development of the age in which he lived. Only half of these responsa have been published, as they number three thousand. Adret had to contend with the external enemies of Judaism as well as with religious dissensions and excesses within its own ranks. He wrote a refutation of the charges of Raymund Martini, a Dominican monk of Barcelona, who, in his work, "Pugio Fidei," had collected passages from the Talmud and the Midrash and interpreted them in a manner hostile to Judaism. These charges also induced Adret to write a commentary on the Haggadot, of which only a fragment is now extant. He refuted also the attacks of a Mohammedan who asserted that the priests had falsified the Bible. M. Schreiner ("Z. D. M. G." xlviii, 39) has shown that this Mohammedan was Aḥmad ibn Ḥazm, and the book referred to was "Al-Milal wal-Niḥal" (Religions and Sects). Adret opposed also the increasing extravagances of the Cabalists, who made great headway in Spain and were represented by Nissim ben Abraham of Avila, a pretended worker of miracles, and by Abraham Abulafia, the cabalistic visionary. He combated these with vigor, but displayed no less animosity toward the philosophic-rationalistic conception of Judaism then prevailing, particularly in France, which was represented by Levi ben Abraham ben Ḥayyim, who treated most important religious questions with the utmost freedom, and who was joined by the Spaniard Isaac Albalag and others. Opposed to these was another tendency, the chief object of which was the preservation of the pure faith of Judaism. At the head of this movement stood Abba Mari ben Moses ha-Yarḥi, called also En Duran Astruc de Lunel. He appealed to Adret for assistance. An extensive correspondence ensued between the authorities of southern France and northern Spain, Adret taking a most important part. Afterward this correspondence was collected and published by Abba Mari, in a separate work, entitled "Minḥat Ḳenaot" (The Offering of Jealousy), Presburg, 1838 (see full analysis in Renan's "Les Rabbins Français," pp. 647-694). Adret, whose disposition was peaceable, at first endeavored to conciliate the opposing spirits. Ultimately he was called upon to decide the affair, and on July 26, 1305, together with his colleagues of the rabbinate of Barcelona, he pronounced the ban of excommunication (ḥerem) over all who studied physics or metaphysics before the completion of their thirtieth year. A protest against this ban may be found in a poem in which Philosophy "calls out in a loud voice against . . . Solomon ben Adret and against all the rabbis of France . . . who have placed under the ban all people who approach her" (see H. Hirschfeld, "Jew. Quart. Rev." xii. 140). Those who desired to study medicine as a profession were exempted from the ban. A special ban was pronounced against the rationalistic Bible exegetes and the philosophic Haggadah commentators, their writings and their adherents. The enforcing of these bans caused Adret much trouble and embittered the closing years of his life. He left three sons, Isaac, Judah, and Astruc Solomon, all of whom were learned in the Talmud. Of the works of Solomon ben Adret there have appeared in print: (1) Responsa, Bologna, 1539; Venice, 1545; Hanau, 1610, etc. The second part appeared under the title "Toledot Adam" (The Generations of Man) at Leghorn in 1657, the third part at the same place in 1778, the fourth part at Salonica in 1803, and the fifth part at Leghorn in 1825. (2) A manual on the ceremonial laws to be observed in the home, "Torat ha-Bayit ha-Aruk" (The Complete Law of the House), published at Venice in 1607, at Berlin in 1762, at Vienna in 1811, etc. (3) The shorter manual, "Torat ha-Bayit ha-Ḳaẓir" (The Short Law of the House), published at Cremona in 1565, and at Berlin in 1871. A number of his commentaries and novellæ on Talmudic treatises have been printed. (4) Commentaries upon seven treatises published at Constantinople in 1720, and at Berlin in 1756. (5) Similar disquisitions upon five treatises were published at Venice in 1523 and at Amsterdam in 1715. He wrote besides a number of disquisitions upon single treatises. (6) The "Pisḳe Ḥallah" (Decisions on Ḥallah), published at Constantinople in 1518, and at Jerusalem in 1876. (7) The "'Abodat ha-Ḳodesh" (The Holy Service), on the laws of Sabbath and festivals, published at Venice in 1602. His polemical work against Mohammedanism was edited by Perles, as an appendix to the latter's monograph on Adret. Kaufmann, Die Sinne, p. 19.